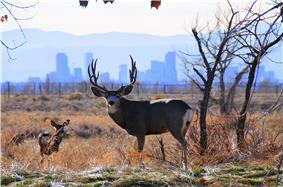 Mule deer in Rocky Mountain Arsenal National Wildlife Refuge; downtown Denver is visible in the background. The Rocky Mountain Arsenal National Wildlife Refuge is a 15,988-acre (64.70 km2) National Wildlife Refuge located adjacent to Commerce City, Colorado, in the United States. It is approximately 8 miles (13 km) northeast of downtown Denver. The facility is on the grounds of the former Rocky Mountain Arsenal, a United States Army chemical weapons manufacturing facility. The site was designated a national wildlife refuge in 1992 by the United States Congress, and underwent a costly environmental cleanup in order to remove pollutants. The refuge is managed by the United States Fish and Wildlife Service. More than 330 species of wildlife inhabit the refuge, including deer, coyotes, white pelicans, owls, and American bison. The Rocky Mountain Arsenal (RMA) was built in 1942 to manufacture chemical weapons. A portion of the site was leased to private industry in 1946 for petroleum production and agricultural and industrial chemical manufacturing. When the American chemical weapons program was shut down after the Vietnam War, the RMA served as a site for dismantling and disposing of these weapons. The Shell Oil Company also used a portion of the site in the 1980s to produce pesticides. The RMA was closed in 1985, and in 1987 environmental testing revealed that the site was extremely polluted. The RMA was listed on the National Priorities List, a list of hazardous waste sites in the United States eligible for long-term remedial action (cleanup) financed under the federal Superfund program run by the Environmental Protection Agency. U.S. Fish and Wildlife Service (2013). Rocky Mountain Arsenal National Wildlife Refuge: Draft Habitat Management Plan (PDF). 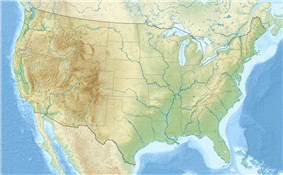 Commerce City, Colo.: U.S. Department of the Interior. Retrieved September 23, 2014. ^ a b c "Interior Secretary Norton to Dedicate Former Army Chemical Weapons Facility as National Wildlife Refuge". U.S. Department of the Interior. April 14, 2004. Retrieved September 22, 2014. ^ a b c d U.S. Fish and Wildlife Service 2013, p. i. ^ Ingold, John (November 2, 2007). Dew of Death' Discovery Shuts Wildlife Refuge"'". The Denver Post. Retrieved September 22, 2014. ^ a b "Rocky Mountain Arsenal National Wildlife Refuge Act of 1992. Pub.L. 102-402". GovTrack.us. October 9, 1992. Retrieved September 23, 2014. ^ a b "Ex-Arms Production Site to Open as Wildlife Refuge". Associated Press. April 17, 2004. ^ U.S. Fish and Wildlife Service 2013, p. 7. ^ U.S. Fish and Wildlife Service 2013, p. 1. ^ a b "NPL Partial Site Deletion Narrative, Rocky Mountain Arsenal (USARMY), Adams County, Colorado". Environmental Protection Agency. July 31, 2006. Retrieved September 23, 2014. ^ "Interior Secretary Ken Salazar Joins Partners At Celebration of Transformation of Rocky Mountain Arsenal". U.S. Department of the Interior. October 15, 2010. Retrieved September 22, 2014. ^ U.S. Fish and Wildlife Service 2013, pp. 1-2. ^ a b Finley, Bruce (December 17, 2013). "Rocky Mountain Arsenal National Wildlife Refuge Rounding Up 27 Bison to Thin Hungry Herd". The Denver Post. Retrieved September 22, 2014. ^ "Remarks for Secretary Salazar Rocky Mountain Arsenal Visitor Center Ribbon-Cutting". U.S. Department of the Interior. May 26, 2011. Retrieved September 22, 2014. ^ U.S. Fish and Wildlife Service 2013, p. 23. ^ U.S. Fish and Wildlife Service 2013, p. 2. A record 300,000 people visited the refuge in 2013, and refuge officials say they expect visitation to top one million annually once visitor facilities, outreach plans, and a wildlife management plan are completely in place. A Comprehensive Management Plan for the refuge was finalized in June 1996. Under the plan, the refuge is available for public use, and community outreach and educational programs will be implemented to encourage public use. As of 2013, the USFWS had identified 332 species of wildlife on the refuge. Most of these species, however, existed only in very low numbers. Beginning in 2011, the USFWS began implementing a plan to remove invasive plant species and restore native plants on most of the refuge. About two-thirds of the refuge consists of mixed-grass and shortgrass prairie, while the remainder is a mix of forest, shrubland, and lakes, streams, and riparian areas. A large number of man-made features dot the landscape, including irrigation ditches, lakes and ponds, and former homesteads. The refuge's Visitor Center opened on May 21, 2011. Sixteen American bison were brought from the National Bison Range in Montana to an enclosed 1,400-acre (5.7 km2) section of the refuge in March 2007 as part of the USFWS Pilot Bison Project. The number of bison reached 87 in 2013, forcing the USFWS to cull the herd to just 60 animals as the limited acreage could not support so many animals. USFWS officials said that in a few years they will expand the bison acreage to 12,000 acres (49 km2), which will allow the herd to expand to an anticipated 210 animals. Although all land to be included in the Rocky Mountain Arsenal National Wildlife Refuge has been turned over to the Department of the Interior, management of the refuge remains the responsibility of both the USFWS and the U.S. Army. Because some land may still contain chemical weapons devices (such as unexploded projectiles or buried equipment) and cannot safely be integrated into the wildlife refuge, the Fish & Wildlife Service manages only 14,904 acres (60.31 km2) of land. The remainder of the property (1,084 acres (4.39 km2)) is managed by the U.S. Army. The USFWS and Army signed an inter-agency agreement to cooperate in the management of the Army land according to UWFWS principles. The entire 17,000 acres (69 km2) of the old RMA was included in the remediation effort. On January 21, 2003, the Environmental Protection Agency (EPA) certified 940 acres (3.8 km2) as ready for use, and this acreage was turned over to the USFWS. Another 5,053 acres (20.45 km2) were certified clean on January 15, 2004. This allowed USWFS to formally open the Rocky Mountain Arsenal National Wildlife Refuge on April 2, 2004. At that time, walking trails gave guests access to about 2,000 acres (8.1 km2) of the refuge, and buses allowed visitors to tour another 3,000 acres (12 km2). EPA released another 7,399 acres (29.94 km2) on July 31, 2006. The remaining 2,596 acres (10.51 km2) were declared contaminant-free and turned over to the refuge on October 15, 2010. The total cost of the cleanup was $2.1 billion. At the time the refuge was established, the RMA consisted of more than 17,000 acres (69 km2) of grassland dotted with small manmade lakes and ponds. Not all of this land was set aside for the refuge, however. Section 2(c)(2) of the enabling legislation set aside 12.08 acres (0.0489 km2) for use as the South Adams County Water Treatment Plant and 63.04 acres (0.2551 km2) for a United States Postal Service facility. Section 5(a)(1) of the act designated another 815 acres (3.30 km2) for public sale. The former Shell Oil Company land also proved to be a problem, as it was somewhat geographically isolated from the rest of the refuge and not likely to be used by wildlife as habitat. Subsequently, about 100 acres (0.40 km2) of the Shell Oil site was sold to Commerce City in 2010. Of the remaining 250 acres (1.0 km2) of the Shell site, 100 acres (0.40 km2) are (as of 2013) being used for a water treatment facility and another 150 acres (0.61 km2) for domestic livestock grazing. The USFWS anticipates selling these 250 acres (1.0 km2) by 2023. These land set-asides, sales, and transfers left the refuge with 15,988 acres (64.70 km2) of land.